Admission is free, but you need a ticket. Book it at the box office of the Savoy Theatre (0 €) or via Lippupiste (0,5 € + commission). The Finnish Big Band Association and UMO Helsinki Jazz Orchestra are organising Esko Linnavalli Big Band Composition Competition now for the eighth time. The final round of the competition is held at Savoy Theatre on the 28th of May. The aim of the competition is to promote Finnish big band music and bring forth some of its new craftsmen and -women. The preliminary jury decides max ten compositions that are heard on the final round, and UMO Helsinki plays them in this final concert. In the concert, the jury chooses the three prizewinners. 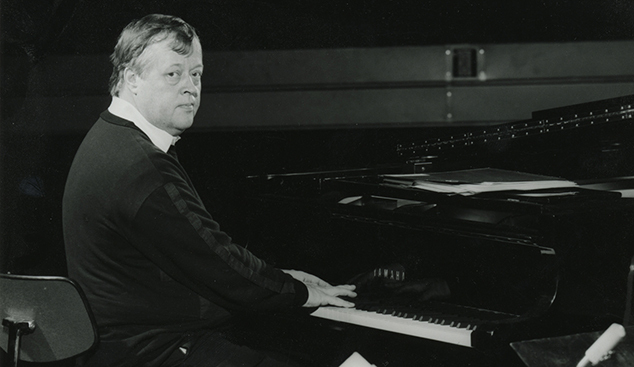 The competition pays homage to UMO’s late founding father, conductor Esko Linnavalli (1941–1991), the artistic director of the orchestra in 1975–1991. Thanks to Linnavalli, UMO developed into an internationally distinguished jazz orchestra and a steady pillar of the Finnish music scene. The Finnish Big Band Association and UMO Helsinki organized the first Esko Linnavalli Big Band Composition Competition in 2005. The competition has grown ever more popular, and the event has brought many fledgling Finnish composer talents to the knowledge of the public and big bands. The conductor of the concert is Antti Rissanen. Please note! The concert will be held in the Savoy Theatre at 12-14. The admission is free but it is recommendable to book a ticket in advance at the Savoy Theatre box office (0 €) or Lippupiste (0,5 € + commission). Pre-tickets admit the audience until 11:50am, after which the remaining seats will be given to customers without a pre-booking. Please arrive early for the doors will be closed once the concert has started. Production: The Finnish Big Band Association & UMO Helsinki Jazz Orchestra.